Miss Josephine Winchell and Herbert Van De Velde, a prominent couple of Yorktown, were united in marriage Monday morning at 8:00 o'clock at the St. Mary's rectory in Tampico. They were accompanied by Miss Louella Van De Velde, a sister of the groom, and Lloyd Hamlink of Thomas, an intimate friend of the groom. The bride and bridesmaid were attired in gowns of crepe of eggshell tan. The ceremony was witnessed only by the immediate relatives, and was following by a wedding dinner at the home of the groom's parents, Mr. and Mrs. Ben Van De Velde of Yorktown. 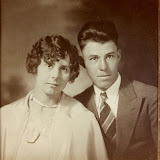 They left shortly after on a motor trip to Canada, where they will visit the bride's parents, Mr. and Mrs. Clarence Winchell of Kindersley, Saskatchewan, Canada, and other relatives.